Mini 165cm and International 210cm. Our BSJA specification Puissance wall are made from 18mm marine grade plywood for stronger and longer life. As with all our walls the base and large blocks are braced internally. Exterior painted three coats with a Puissance brick design both sides. Interior preservative dipped. As with all our walls we recommend that they are stored under cover during winter months when not in use. All our walls come complete with a pattern on both sides as standard. 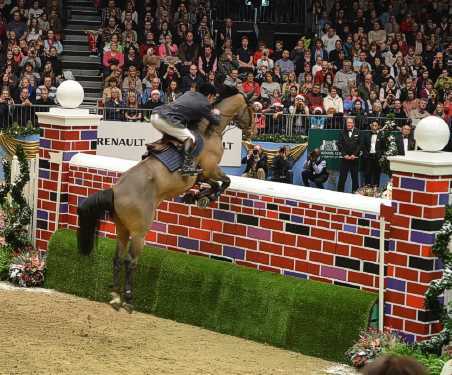 Our Puissance walls however are a little different we paint them to replicate the official Puissance brick wall as used at Olympia and the Horse of the Year Show. Please note the picture left shows the actual Puissance wall at Olympia and is shown just to demonstrate how we have replicated the brick design and wall bank. Each wall height has a different number of bricks, enabling you to make many different heights with just one wall. Give you wall a professional finish.